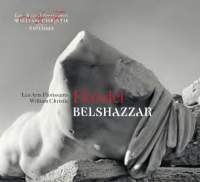 Following a trend, William Christie and Les Arts Florissants have established their own CD label, their first release being this recording of Handel’s Belshazzar. Christie writes in the booklet that their method is to give public performances and then go into the studio and make the reconding: the opposite of Opera Rara’s route of recording and then presenting a live concert. It’s somewhat chicken and egg as to which way is better. As with many of Handel’s vocal works, there is no set-in-stone version of Belshazzar. Before the oratorio’s initial outing, at the King’s Theatre in the Haymarket in London on March 27th, 1745 , Susannah Cibber, who should have sung the part of Daniel, became ill, requiring Handel to redistribute some of the roles. John Beard, the tenor engaged to sing Belshazzar, also had to take on Gobrias, written for bass, thus cuts and transpositions were made. 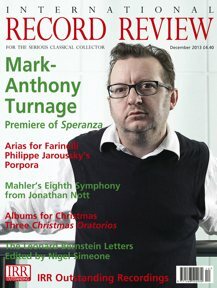 In years to come, the composer introduced more revisions. Chnistie has decided to choose ‘what we consider to be the most successful of the various versions of Belshazzar given during his lifetime’. The only change of voice category from what was originally planned in 1745 is that the role of Daniel, meant for Mrs Cibber, a contralto, is sung here by a countertenor. For his libretto, Charles Jennens resorted to The Book of Daniel in the Old Testament and writings by Herodotus and by Xenophon. From the former of those two writers he took Nitocris, Belshazzar’s mother, and from Xenophon came Cyrus, Prince of Persia, and Gobrias. The story of Belshazzar, Daniel and the writing on the wall should be well enough known not to take space here. Suffice it to say that Belshazzar is a licentious monarch, the King of Babylon, whose mother despairs of her son’s dissolute lifestyle. Cyrus and his Persians are besieging the city of Babylon, together with Gobrias, whose son was killed by order of Belshazzar. Daniel is a prophet among the captive Jews. Unlike such Handel oratorios as Judas Maccabaeus, Saul or, of course, Messiah, Belshazzar has not yielded arias that have become well known, yet there are some which definitely deserve more exposure. Daniel’s arias in Act 1, ‘Lament not thus, O Queen’ and ‘ O sacred oracles of truth !’, are two that I have enjoyed, particularly pleasing in this recording because of Iestyn Davies’s liquid tones and flowing lines. He also has an unusual piece, the accompanied recitative ‘Thus saith the Lord to Cyrus’, to which Handel sets a melody despite the words being prose rather than verse. Davies is on top form whatever and whenever he sings. The orchestra consists of 38 players, who bring enthusiasm, but not roughness, and pleasing dulcification as the music requires. The final anthem, ‘I will magnify the Lord’ is a glorious composition for Daniel and Nitocris with the chorus. Handel begins with a gorgeous tune for the oboe, delightfully played by, presumably, Pier Luigi Fabretti, reminding me why the oboe is my favourite wind instrument. The two voices intertwine delectably. Nitocris is sung by Rosemary Joshua, whose voice sounds fresh and who has the flexibility necessary for the role. She has a vibrato to which some may object even though it is not always noticeable; her tone is in no way pallid but has clarity. Belshazzar makes his entry with a coloratura aria called ‘Let, festal joy triumphant reign’, its title giving an idea of the king’s mood as he orders ‘free flow the wine, nor flow in vain’ at his feast. Allan Clayton deals with it in accordance with its spirit, negotiating cleanly the runs in the voice part. He shows another side of his interpretation in Belshazzar’s recitative ‘Away! Is then my mother convert grown’ (track 5 on the second CD) as the king shows his contempt for his mother’s warning. The Handel scholar Anthony Hicks wrote that the composer ‘does not exclude a sympathetic view of Belshazzar, seen more as an irresponsible young man than a vicious tyrant’. Gobrias is taken by Jonathan Lemalu, whose voice contrasts with the others not only because he is the one bass but because it is rougher and has a rather more grating sound on occasion, though he does manoeuvre it without having to use aspirates. Smoothness to match that of Davies is produced by the Australian mezzo Caitlin Hulcup, on whose fine breath control I commented in February 2011 regarding her singing of Arbaces in Arne’s Artaxerses. Her Cyrus reveals in the various arias the warmth in her tone . She and Joshua reflect the beauty of their duet, ‘Great victor, at your feet I bow’, near the end of the oratorio. Handel inserts at least ten choruses. The 26 voices of the choir pour out a grand sound, well integrated. Christie asks in his note, ‘How could one not be struck by the majestic architecture of the choruses?’ They are done justice by this group. He himself is attuned to the music’s grace, beauty and emotions so that all serve Handel’s score with, as he writes, ‘a dialogue . . . animated by mutual respect and the greatest of passion’. The recording is somewhat hollow and spacious, so that voices do not always emerge as clearly as they should. Because I wanted to concentrate on this new recording I have refrained from comparing it with the Archiv set under Trevor Pinnock, which has a cleaner acoustic and a cast that includes two fine singers no longer with us: Anthony Rolfe Johnson and the adorable Arleen Auger. The editions are virtually identical. Be happy with either.